At first, this title makes us feel like we’re entering a dark room. But I promise this darkness won’t stay for long, and by the end of the article, as our mind understands and gets comfortable with this truth of life, we will see bursts of light. 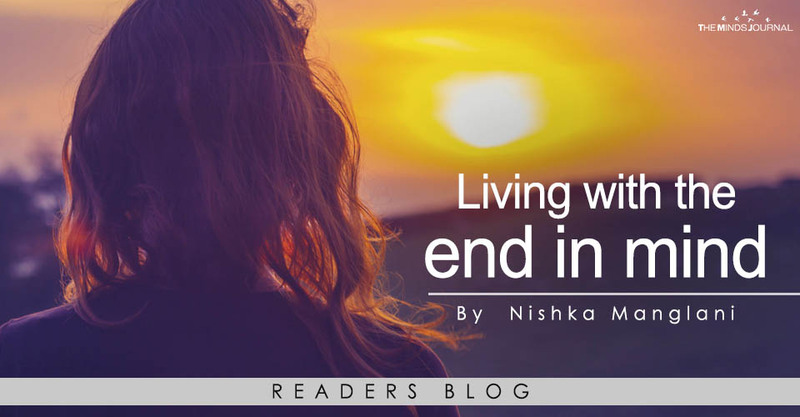 Living with the end in mind is perhaps the fullest, most real way to live life because the only thing guaranteed to happen to each one of us is our end. At first when we read this sentence, it may not feel good – but it is the ultimate truth. Let’s read it again, slower this time – the only thing guaranteed to happen to each one of us is our end. As we feel at home with this statement, it becomes really comforting. What if we can live with the consciousness that this life in indeed finite? What if we worked our life, our mindset, our bodies around this? Day in and out, we find ourselves in unpleasant situations, not just with people we don’t care about, but on the contrary, more so, with people we care. What if the next time you find yourself in the middle of such a scenario and ask – what if today was all there was to life?, what if tomorrow never comes? How would I then respond to the situation? I bet it would be very very different. There won’t be too many sorrows or regrets we’d want to keep, there won’t be too many hearts we’d like to leave weak. Stephen Covey, the author of highly acclaimed The Seven Habits of Highly Effective People, lists this as one of the most important habits for people to cultivate. He refers to it as ‘Begin with the End in Mind’. The chapter that highlights this in the book begins with asking us to imagine we’re at a funeral. But not any old funeral, our funeral! In its most basic form, the ‘Begin with the End in Mind’ maxim refers to always having the end of our life as our frame of reference to evaluate everything else. It’s about doing things with a clear idea of our destination, so that the steps we take are always in the right direction. It’s like when we work, we take up jobs, one of our goals is to save for retirement, old age. We work with the end in mind, because we want to be comfortable in the end.